With no record companies ever breathing down his neck for a follow up to a hit album, singer-songwriter Jeff Cannata has always been left to his own devices to make records in his own time. While this has meant that he hasn’t always been particularly prolific – with just a couple of albums per decade to his credit since the early 80s – you could never say his work was shoddy. Whenever an album with Cannata at the helm appears, you can be assured it’ll be filled with shiny, multi-layered goodness…and 2013’s ‘Harlequins of Light’, released under the Arc Angel moniker, is no exception. Although the opening track – the album’s title cut – features a few more guitars than some of Cannata’s prior works and the synthetic strings are a great touch, at the centre of this tune, he settles for many of his more familiar musical signatures. There’s a lot going for this title cut on face value; in addition to JC’s gift for melody, the musical flourishes on piano are lovely, as indeed are the guitar leads appearing at the close. It’s a strong opening statement, even if it doesn’t break any huge amount of new ground. 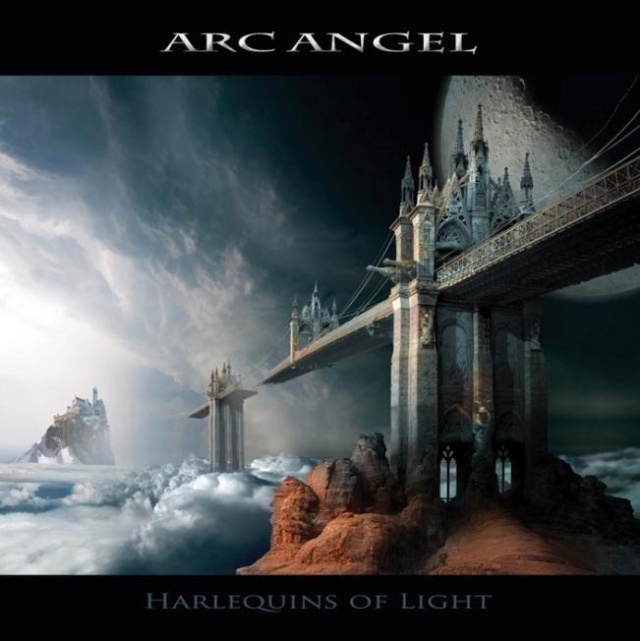 Moving away from the pomp/prog sounds, most of the rest of this Arc Angel album sounds almost the same as Cannata’s work released some two decades previously. For the average fan, that’s going to be somewhat of a blessing. Turning to a much more traditional pop feel, ‘As Far As The Eye Can See’ hints at a Rick Springfield-esque hook, but beyond that, it’s a number which would have been totally at home on the classic ‘Watching The World’ album [released on the defunct Now & Then Records label in 1993]. The presence of a studio processed choir of voices on show (a sound only rivalled by Jeff Lynne for instant recognisability) ensures that the core of this number is classic Cannata, while from an AOR perspective, everything is very catchy. Equally poppy, ‘Get To You’ features a rare appearance of acoustic guitar rhythms, but these are quickly overlaid by a pumping bass and soaring guitar lead. There are some pleasing organ flourishes – leading to an old-fashioned 70s solo that’s slightly at odds with the 80s-ness of everything else, but it all works well. Between the acoustic pop and mellotron bursts, Cannata does what comes naturally, in that his shiny voice delivers a great melody and hook. Sounding like ‘The Ladder’ era Yes in its attempts at tapping into a very pop sound, it mightn’t quite reach the heights of his earlier ‘Let It Be’, but it’s more than solid enough. ‘Amnesia (For The Rest of Your Life)’ is a touch quirkier than a lot of the material here. Waving in and out of a busy bassline and groove-laden drums, soaring guitars break up vocal lines and melodies to create something with more than a passing resemblance to ‘Big Generator’ era Yes and Billy Sherwood’s World Trade. While Cannata’s stacked up and shined up vocals are a little clinical due to their over-processed nature, everything here works just brilliantly. It’s such a good tune, it’s even possible to forgive its most dated aspect: in this case, pan-piped keyboards with the same tone as the China Crisis hit ‘King In a Catholic Style’… Recovering from a dodgy piano and voice intro that sounds like the kind of sappy musical theatre beloved by Styx’s Dennis DeYoung, the mid-paced workout ‘Tonight…Forever’ is another highlight. Mixing classic AOR sounds with a touch of pomp, this number works a simple bass and equally unfussy chorus and dresses them with great decorative musical flair. There are tinkling keys that sound like marimbas and some great harmonies throughout, as well as some hugely unexpected pompy keyboards midway… Being a Cannata record, obviously the pop edge and chorus are all important, but everything here eventually gets outshone by a beautifully executed lead guitar solo, full of lovely sweeping motifs. When trying to be cleverer lyrically – as is the case with ‘Voice of the Illuminati’ – Canatta ought to miss the mark [honestly, who takes a word like that and thinks it’ll scan well?! ], but even then, he proves he’s a master musical arranger. On this particular number, his love of keyboards leans towards the stuff of Vince DiCola soundtracks of the 80s, while the rest of the arrangement pulls elements from so much classic AOR that has gone before. Somehow, although everything sounds like Cannata/Arc Angel by numbers, the level of professionalism and the typically faultless production values makes this an unmissable listen. If, for whatever reason, a few of those tunes just were not enough to remind you of ‘Watching The World’, there’s also a re-recording of ‘Through The Night’ (a number originally heard on that classic disc) included on this release. Although slightly tougher in its 2013 incarnation, it mirrors its 1993 counterpart in most respects. Twenty years on from the original, it still sounds great and the few extra guitars, if anything, are a welcome addition. A revisitation of ‘Fortune Teller’ (originally from Cannata’s 1988 offering ‘Images of Forever’) fares just as well. Again, with the guitars beefed up slightly and with the multi-tracked vocals bigger than ever before, Cannata adds a little extra something to a much-loved work, but (thankfully) never seems too tempted to replace any of the 80s elements which could be seen as dated. After all, if he replaced its eighties heart, most of the original charm would be lost! While the ravages of time mean parts of Cannata’s voice appears slightly deeper in places, that slight change in voice is literally the only signifier that this Arc Angel release wasn’t recorded back in the late 80s. While some may scoff that his shiny 80s sound is out of step with the twenty-first century (perhaps even more so than some other artistes working inside their melodic rock bubble), this album represents classic, classic Cannata almost throughout – and it is a record which his existing fans will love. Although ‘Harlequin’ extends many over-familiar musical themes and completely plays it safe in a way that feels like a visit from a old friend, that doesn’t stop it being one of 2013’s best AOR releases. This entry was posted in Album & EP Reviews and tagged aor, frontiers records, jeff cannata, melodic rock, prog by Real Gone. Bookmark the permalink.